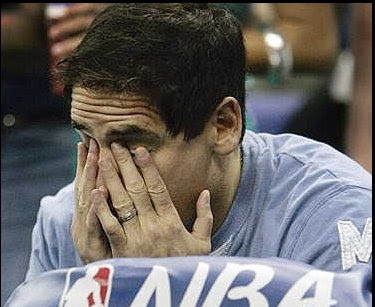 Once again the Dallas Mavericks have failed to show up when it mattered most. I've been watching this franchise for most of my life and I have grown as the organization has, but sadly I have had far more success. Dallas has consistently underachieved and the two times they have been on the cusp of doing something great (1987, 2005) they have choked and not sealed the deal. This is something that causes me a lot of frustration. I have put in a lot of time standing behind this team. I was rooting for this team back in the 1990s when they were the second-worst franchise in the NBA (thank goodness for the Timberwolves) and were struggling to keep from setting the record for most losses in an NBA season. I still remember getting chased across the playground because I wasn't one of the cool kids cheering on the Bulls and Michael Jordan. I wanted to stick with my hometown boys. Well, every blog has to have a first post so this is it. I have another blog that I mainly use to put out information on my "nerdyness" and it wasn't the place for some of the things I wanted to blog about, such as what types of things I have been up to and funny stuff I see. So this led me to create this Black Braveheart blog. I plan to post pictures from things I do and keep an updated dialog about what I have been up to over time. I know not many people will read it, but much like my nerdy blog it will keep me entertained. Hopefully some of you will be entertained by it as well.